It's a full 40-car field for the Cup Series. Rejoining this week is Motorsports Business Management, which we last saw two races ago at Chicagoland. Timmy Hill will drive the #66 Chevrolet, having finished 28th in June. A new challenger approaches - eventually. For the first time since May, a new Cup Series team has joined the ranks. Welcome aboard StarCom Racing, a team that has apparently taken the Kaulig Racing approach of a driver’s sponsor taking a larger role with the team. StarCom sponsored the latest of Derrike Cope’s 13 starts this season at Richmond and has remained with the driver after he parted ways with Premium Motorsports. 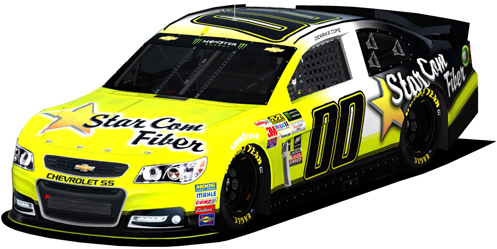 The black-white-and-gold Chevrolet will carry car #00, a number absent from the series since David Reutimann lost his ride with Michael Waltrip Racing at the end of 2011. The team made the preliminary entry list, but on Tuesday, personnel hiring forced them to withdraw. StarCom has yet to announce when they will make their debut, but will likely make at least one Playoff race as they prepare for a 2018 run. Following the withdrawal of StarCom Racing, BK Racing entered their second car, the #83, with Brett Moffitt and sponsor HikVision. Moffitt and his car were missing from the preliminary entry list, but will now join teammate Corey LaJoie in the primary #23 with a new sponsor of his own: FreshBeards. Dover also sees the return of Ross Chastain to Cup competition for the first time since his impressive 20th-place finish in his series debut here in June. Now as then, Chastain drives in place of Reed Sorenson at Premium Motorsports in the #15 Use Your Melon, Drive Sober Delaware Chevrolet. Sorenson himself slides over to Premium’s #55 Sundance Vacations Chevrolet, his first run in the second Jay Robinson machine since Richmond earlier this month, where he ran 30th. Mechanical gremlins on a hot New Hampshire afternoon ended the day early for Rick Ware Racing, which also returns to action this Sunday at Dover. Cody Ware is again the driver in what will be his first repeat visit to a Cup Series track. His run at “The Monster Mile” in June left him 35th at the finish, out with handling problems, but ironically his best finish of 2017. The #51 Chevrolet carries sponsorship from Donnie Neuenberger’s Foundation, an organization the NASCAR veteran started to benefit cancer patients and their families. 11 of Neuenberger’s 40 XFINITY Series starts came at Dover with a best finish of 25th in 2007. Eleven years ago, Richard Childress funded the racing efforts of one of his former employees, Kirk Shelmerdine, by putting the name of his vineyard on Shelmerdine’s car in the 2006 Daytona 500. This weekend, Childress Vineyards was again scheduled to sponsor a car, this time Ryan Newman’s #31. On Thursday, however, last-minute backing came from WasteMasters Solutions. Newman arrives just one point out of a spot in the Round of 12 behind both Ricky Stenhouse, Jr. and his own teammate Austin Dillon. Newman has three wins in 31 Cup starts at Dover, and most importantly ended a streak of four finishes of 16th or worse with a 4th-place showing this past June. UPDATE (Friday Sept 29): The entry list grows to a full 40 at the last minute as RSS Racing enters a third car, #38, with Gray Gaulding behind the wheel. The series has yet to have a short field in 2017. 39 drivers are entered to drive in Saturday’s companion race, which once again threatens the first short field of the 2017 XFINITY Series season. The list was first shortened by GMS Racing, which again pulled Ben Kennedy’s #96 Chevrolet by the time the preliminary list was posted. News then broke on Monday that a lack of sponsorship forced Dakoda Armstrong to part ways with JGL Racing, and would not enter the #28. The move put the brakes on a season that saw Armstrong 13th in points after Kentucky with a 5th at Iowa and a new career-best 3rd at Daytona. JGL has instead entered the #24, withdrawn at Chicago and missing at Loudon, with Corey LaJoie pulling double-duty. JGL announced that they will run the #24 in place of the #28 for the rest of 2017. Also returning from a one-week hiatus is Biagi-DenBeste Racing’s #98, driven to a 10th-place run by Darrell Wallace, Jr. at Chicagoland. Casey Mears will drive the #98 GEICO Military Ford for the first time since his 25th-place showing at Richmond. Josh Bilicki returns to B.J. McLeod's #78 Chevrolet with his sponsor Prevagen. He last drove this car two rounds ago at Chicagoland, where he finished 34th. Meanwhile, Motorsports Business Management has brought Chad Finchum back for the first time since his 28th-place run at Bristol, and will again drive the #40 Chevrolet alongside teammate Timmy Hill in the #13. At the back of the field, Jeff Green is again in the #93 RSS Racing Chevrolet and eyes his 99th career XFINITY Series last-place finish that would lock up his sixth LASTCAR title. Joining him is Reed Sorenson, who is back in JD Motorsports’ #15 Chevrolet which earned its first last-place run at Chicagoland with Matt Mills. As of this writing, Motorsports Business Management has not entered its own “start-and-park” entry, the #72 driven at Kentucky by Carl Long, but that could change by the weekend to keep the field at 40. UPDATE (Saturday Sep 30) Entry list up to 29 trucks as Al Niece has entered a second truck, the #38 run earlier this year, with primary driver T.J. Bell driving. Travis Pastrana runs the team's primary #45 (see below). The stand-alone Truck Series race at Las Vegas has, in recent years, seen some of the shortest fields in recent history. This year is no exception as just 28 trucks are entered, tying Texas for the shortest field this year. It's the second straight race where fewer than 30 drivers will start out of a possible 32. Missing from Loudon’s list are Mike Harmon’s #74 (which was also withdrawn that week) and the second Premium Motorsports #15 for Gray Gaulding. On the other hand, some good news: Travis Pastrana returns to action Saturday following a successful test at Charlotte in May. Pastrana will drive in place of T.J. Bell for Niece Motorsports, and welcomes sponsorship from Wienerschnitzel and Boot Campaign on a brightly-colored red-and-yellow #45 Chevrolet. Fresh off his win under the lights in the ValleyStar Credit Union 300 at Martinsville last Saturday, Timothy Peters is back for the first time since his spectacular crash at Texas, when he drove for MDM Motorsports. With MDM’s #99 also not entered, Peters will this time drive in place of Austin Hill in the #02 Randco / Young’s Building Systems Chevrolet, Peters’ third different team this season. Give a call to Martins Motorsports and Austin Wayne Self, which finished 14th at Loudon and only lost a lap to the leaders in the final laps. It’s the best run by the #44 this year, improving on Self’s 15th-place showing at Michigan. Self returns to the #44 AM Technical Solutions / Don’t Mess With Texas Chevrolet at Vegas, a track where the driver ran 21st last year. Still entered in the field are three of the current LASTCAR Truck Series contenders for the 2017 title: current leader Joe Nemechek in the #87 D.A.B. Constructors, Inc. Chevrolet; runner-up Todd Peck in the #63 Chevrolet for MB Motorsports; and third-place Mike Senica in the Norm Benning Racing #57. Fourth-place Tommy Regan was originally listed in Jennifer Jo Cobb’s #0 Driven2Honor.org Chevrolet that trailed Loudon with Ray Ciccarelli, but by Thursday was replaced with Matt Mills. With five races to go after Vegas, Nemechek, Peck, and Senica can take the LASTCAR lead if they finish last in Saturday’s race.